, Google Maps, and Google SketchUp, including a focus on features like Ocean, Mars, Moon and Sky in Google Earth. Attendees will also learn about innovative instructional strategies, theoretical foundations, and receive resources to share with colleagues. Speakers will share real life examples of how they are using these tools in their classrooms across all subjects. We hope this event will empower educators to bring the world's geographic information to students in a compelling, fresh, and fun way. If you are interested in joining us, please complete this application by April 30, 2012. We will send out invitations based on availability by May 11, 2012. Even if you can’t make it to this event, we have many online resources available on the Google Earth for Educators and SketchUp for Education websites. Check back often for updates! 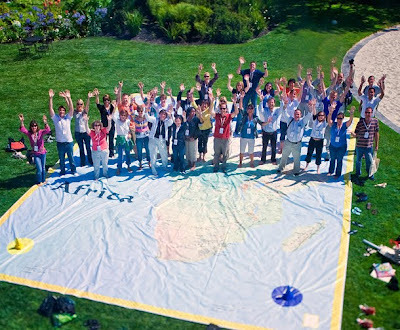 Educators all over the world have used Google's geo products to help students conceptualize, visualize, share and communicate information about the world around them. This summer, we will host two Google Geo Teachers Institutes: June 13 and 14, 2012 in Dublin, Ireland and June 20 and 21, 2012 in London, England. Both events will be held at the local Google office. This two-day event is a free professional development experience designed to help educators get the most from Google's geography-related products and technologies. Participants receive hands-on experience and learn best practices and tips for using Google Earth, Google Maps, and Google SketchUp, including a focus on features like Ocean, Mars, Moon and Sky in Google Earth.